If you want to enjoy a uniquely Kyoto, elegant place where the time flows slowly, I at once recommend this place. Kyo-Yuba Seike Nishijin is a yuba (tofu skin) restaurant in Nishijin. Seike is a restaurant chain in Kyoto with three restaurants, and one of them is here in Nishijin in a renovated townhouse built over 140 years ago. The black plaster walls, spacious garden, the spacious entrance, all this hints at a formal restaurant, but once inside, you feel a somewhat nostalgic feeling get over which helps you relax. This must be because of the beautiful hostess of the restaurant comfortably but surely serves you in an incredibly polite manner. Seike’s yuba is made in Miyama where their main restaurant is, and where there is rich nature and clear water. In Seike’s refined yuba you can taste the soybeans’ sweetness, and in their course Yubazukushi you can taste many kinds of dishes made from yuba like yuba steak and yuba sashimi. Having the extremely luxurious course, in a Japanese room where the time flows slowly, is a superior and special experience. 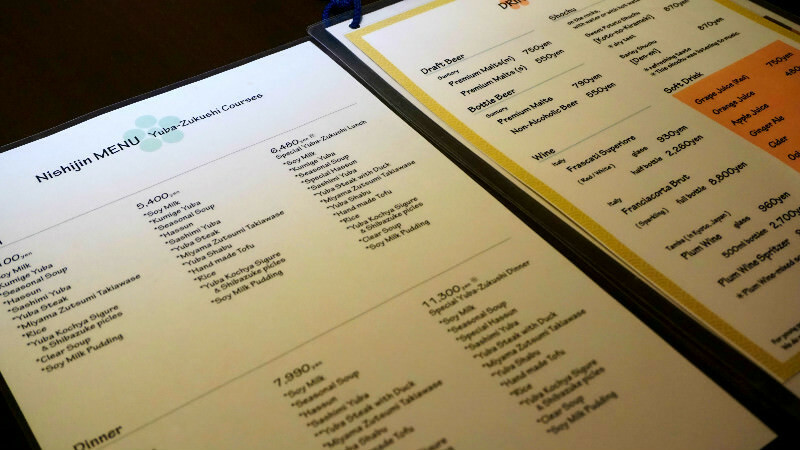 How about adding a special page to your travel diary about the Kyoto specialty, a yuba full course dinner in a machiya townhouse? This course is a chance for you to fully enjoy Seike’s delicate but delicious yuba. The dishes are presented in a kaiseki haute cuisine style, and they use seasonal ingredients with the yuba making the dishes something you can only taste at that time. One special point about this course is that in it there is also a “tsumami yuba” dish that can only be had here at Seike Nishijin. This type of yuba is so scarce it is extremely expensive. 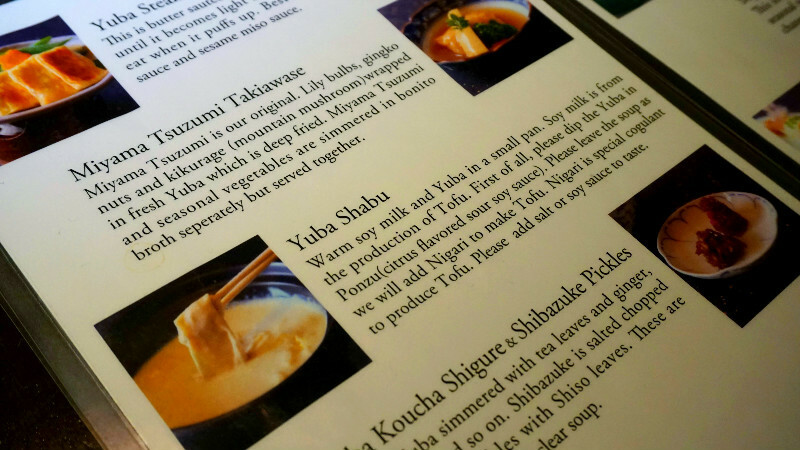 I hope you will enjoy the delicate taste of tsumami yuba while you fully enjoy the yuba dishes. The yuba steak the hostess grills in front of your eyes is best eaten when it starts to brown a bit and puffs up a little. When she starts grilling the yuba steak, you can right away smell the fragrance and this will stimulate your appetite. They have two types of tare sauces: a soy sauce based one and a sesame-miso one. I recommend having the soy sauce based sauce when you want to a mild taste, and the sesame based one when you want a stronger taste but still want to taste the yuba. In this picture you can see Yuba Shabu, a dish not often seen even in Japan. You get a small pot of soymilk brought to your table. When the soymilk is heated a skin is formed on top of it. This is yuba, or tofu skin. If you stir the soymilk with your spoon the yuba will stick to it, and then the recommended way of having it is to lightly dip it in ponzu vinegar. The freshly made yuba is warm, chunky, and a little bit sweet; a delicacy. After eating yuba you put some “nigari” (magnesium sulfate) into the soymilk to make tofu. You can enjoy this dish until the final drop. The charm of Kyo-Yuba Seike Nishijin does not end at the dishes. This restaurant is in a building built 140 years ago, and the building has been named in the 24th edition of Kyoto City’s “The buildings and gardens which make Kyoto attractive.” So the historical value of the building is great. In the tasteful building, you can still feel the remnants of the beginning of the Meiji period in Japanese history, and the house is built around two gardens, so from inside the restaurant it’s possible to see the garden through the big windows. The experience of having delicious yuba at a historic and stylish Kyoto machiya townhouse is unforgettable. I would like you to feel the history and the atmosphere at the restaurant. The course and drinks menu are both in English so ordering is easy. They explain the dishes thoroughly with pictures in the menu, so if you don’t know something or want to ask something about the dishes I hope you check this menu first! reasons, please tell about them when you make your reservation. The restaurant is ready to answer to even more detailed wishes like the removal of dairy, or if you wish not to use bonito stock. ・You need to take off your shoes when you go into the restaurant so please wear socks. ・Most of Seike’s seating is by a western table, but the table closest to the garden can be, as an option, changed into a Japanese table. If you want to have an even more Japan-like experience, how about sitting on a tatami and looking at the garden while you enjoy yuba? This restaurant is in the textile district of Kyoto, Nishijin. It’s in a machiya townhouse built over 140 years ago, and there is also a Japanese garden, and it’s easy to relax at this restaurant. The clean air and clear water of Miyama are used to make yuba steaks and yuba sashimi at the restaurant and both dishes are delicious. Those who want to have Kyoto cuisine should consider this restaurant. 1-minute walk from city bus Imadegawa-Ohmiya stop getting off. 15-minute walk from Subway Karasuma Line Imadegawa station. ・There is a service charge of 10%. ・They are a part of the Kyoto Kimono Passport network, so those wearing a kimono get 10% off. They have an English menu and the staff can speak simple English and use gestures, so you need have no worries when eating here. They also accept reservations online through a reservation form on their website, so your yuba experience will be smooth from the start to the finish.